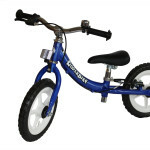 Are foot rests on balance bikes needed? This is a common question that arises when talking to balance bike shoppers. When I say “foot rests”, I am discussing the pegs or bars made to rest a childs feet when gliding on their balance bike. 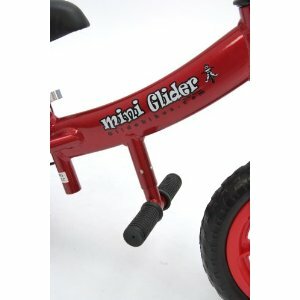 The picture below of the Glide Bikes Mini Glider is a true foot rest. Some bike companies like Strider will claim to have foot rests merely by adding a piece of grip tape to the frame, but in Striders case it is barely enough room to adequately rest a child’s foot on it and be comfortable. When people ask my opinion I say it really comes down to preference. If you told me to argue in favor of foot rests I would say, “they are a great way to get your child in the habit of placing their feet where pedals are located on regular bikes and they allow a child to rest their feet on a really long glide.” If I were to discredit the the selection of a balance bike based on it needing the have foot rests I would say that, “they will get in the way (only Glide Bikes are removable)” or “children feel more comfortable with their feet about 2″ off the ground so they can apply the brakes quickly.” keep in mind that the geometry of some balance bike frames would make for the foot rests being located too high and the child’s legs would be more bowed out and uncomfortable when riding. When looking at all the balance bikes I sell, most of them don’t have foot rests, but that doesn’t make them all bad, just not as popular. So, as I always say, but the bike that fits your child and if it has foot rests great and if it doesn’t, then that is great too. If you are bent on getting a bike foot rest the Glide Bike Mini Glider or Chillafish Jack and Josie bikes are good selections. 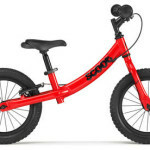 New Scoot XL by Ridgeback Balance Bike Now Available!